The centenary for the Battle of Courcelette is coming up next month, the first of three for the Canadian Corps on the Somme. Courcelette represents not only the first outright success that the Corps had after two years of largely unsuccessful fighting at Ypres, but also the first use of Haig’s latest weapon; the tank. The 2nd Division battalions that advanced to the outskirts of Courcelette were supported by seven tanks, which, according to eyewitnesses terrified their German opponents[i]. Slow moving, and noisy even in the extremely loud atmosphere of an artillery battle, the tanks at Courcelette were an effective terror weapon. 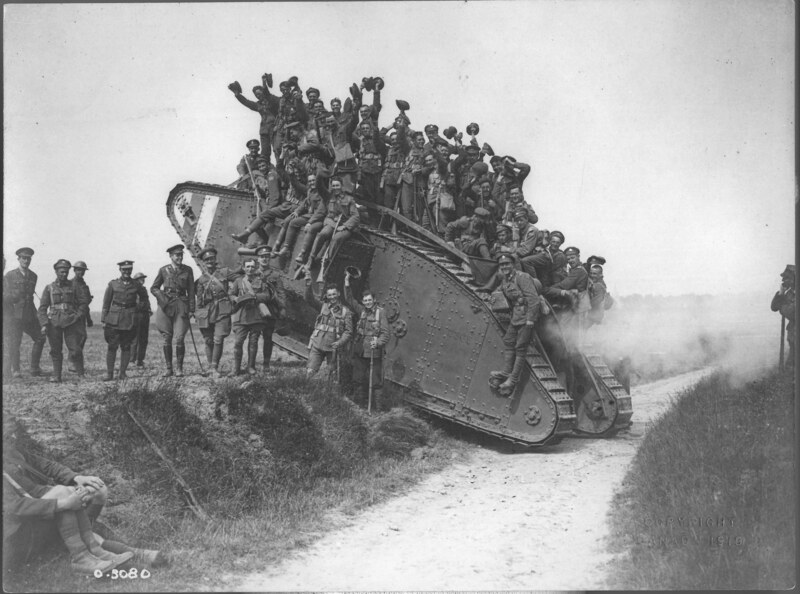 Haig used the tanks again at Cambrai in 1917, and throughout the Hundred Days campaign at the end of the war. The British side of tank development began in 1915 with the formation of the Landships Committee, which was tasked with designing a weapon that could break the siege on the Western Front. Armoured vehicles were used by the Navy in 1914, and the Landships Committee began to experiment with that idea in mind. Tank testing and production were carried out under absolute secrecy, in an effort to prevent German counter espionage, though by the time the tanks were sent to the front in 1916 they were at best an open secret. Haig had originally wanted to use the first tanks on 1 July 1916, when the battle for the Somme began, but production delays made this impossible. As the Somme slowed to an attritional battle in July and August, it was hoped that the tanks would provide the impetus needed to break through the fortified German lines. Like other advancements in military technology, such as the creeping barrage, counter-battery use, and machine guns, using the tanks took time to figure out. On 15 September they were mostly used to lead attacks, meaning holes had to made in the creeping barrage that allowed German counter-fire. The tanks at Courcelette were instead used in a second wave, which came far behind the initial creeping barrage, now focused on the German rear lines. This meant that most achieved their objectives, and the danger to both the infantry escorting them, and the tanks themselves, was considerably less. The French had also begun parallel development of an armoured vehicle, the Renault FT, which had a revolving turret that permitted 360 degree fire. The FT became the standard model for tanks, and was the most produced model of the war, with more than 3 000 produced by 1918. Germany also began to develop a tank, the A7V, in the fall of 1916 that was used on 1918, but it was never mass produced. In many instances, rather than use the A7V, the Germans re-painted captured Allied tanks and used them instead. Though tanks did not see the massed use that they would in the Second World War, their inclusion in a co-ordinated battle with infantry, artillery, and air support were a marker of what was to come 25 years later in 1939.